I love crab cakes. What’s not to like? But one thing that bothers me about ordering them at restaurants is that you’ll occasionally get one that’s loaded with “filler” — aka, breadcrumbs. Total bummer. The crabbier the better, I always say. So why not make them yourself? I’ve made this recipe a handful of times and it always turns out delicious. Plus it feels like you’re eating something special, which is a perk — especially when your husband doesn’t know how easy they were to make. Work that in your favor, ladies. Preheat a large skillet with one tablespoon of olive oil over medium-high heat. 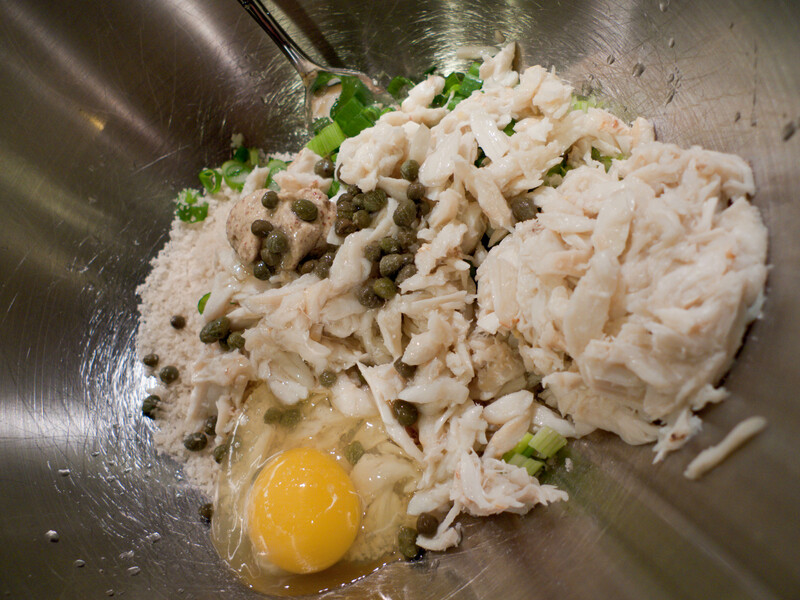 Combine breadcrumbs, scallions, crabmeat and capers in a large bowl. Add mustard, lemon juice, lemon zest, salt, pepper and egg, stirring to combine. Divide the mixture into 2 – 4 even portions (I made 3), shaping each into a 1-inch thick cake. 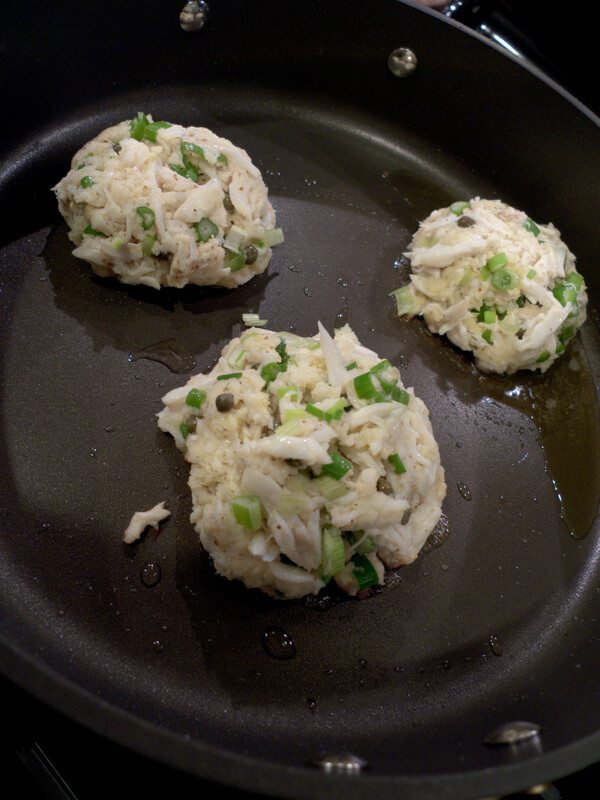 Add crab cakes to skillet, cooking until brown — approximately 4 minutes per side. Be very careful when handling or fipping the cakes to prevent them from breaking. 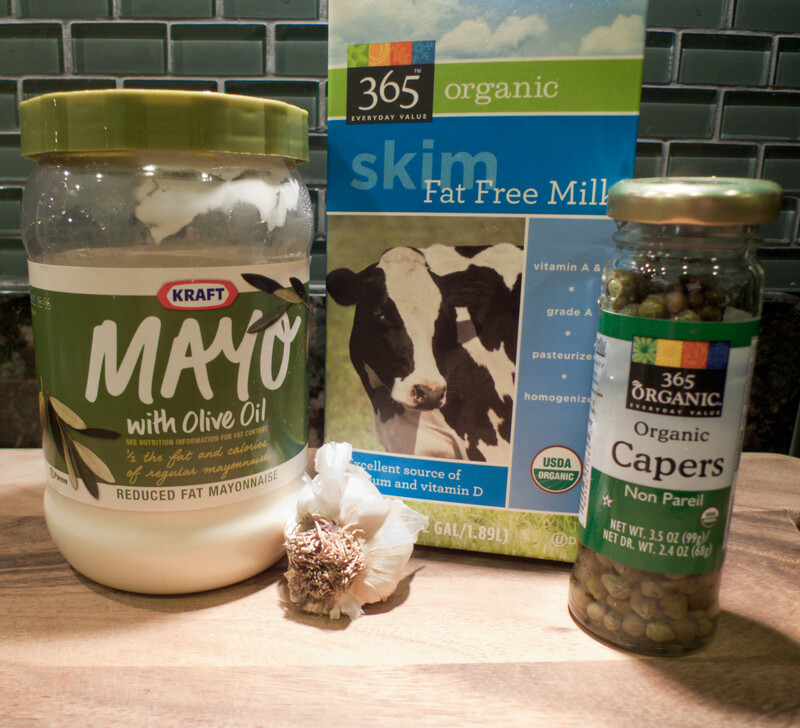 Meanwhile, to prepare the remoulade sauce, combine all ingredients in a small bowl. 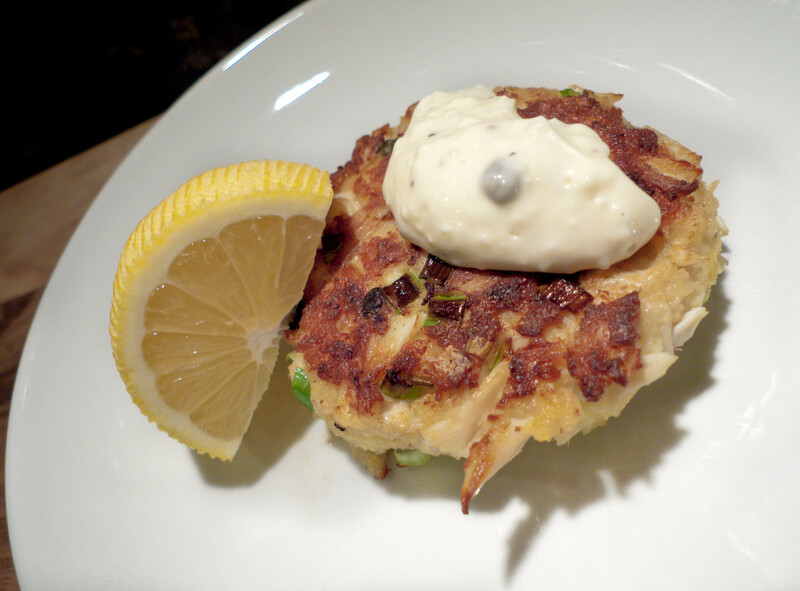 Serve crab cakes topped with a spoonful of remoulade sauce and a squeeze of fresh lemon juice. I really like crab cakes. And remember how skeptical I was the first time I tried one… silliness! I’ve had that problem before too, but seemed to have mastered it as of late. Your idea of chilling them is smart, though. I will try that next time. I agree with restaurant crab cakes. I like it better when we make it at home.Thanks for sharing your recipe.I’ll definitely try this. I made these last night and they were delicious! I added a little hot sauce to my remoulade. That’s awesome! I’m so glad you enjoyed them. I’ll have to try the spicy remoulade next time. So simple to make, I love it!